Anyone familiar with 2004’s “live strong” movement in support of Lance Armstrong has seen a silicone wristband in every color of the rainbow in support of a variety of causes. Now, Oregon State University’s College of Public Health and Human Sciences has discovered a new use for them: saving lives. Active sampling is the process of measuring exposure to different environmental factors, and currently is a slow and laborious process that involves gathering samples individually and testing them with expensive equipment. The silicone that wristbands are made from acts as a perfect base for “personal passive sampling,” collecting trace amounts of chemicals and substances. In an experiment carried out by the aforementioned OSU study, volunteers donned clean silicone wristbands and wore them over a period of time, after which scientists measured how much of what chemicals the silicone had absorbed. 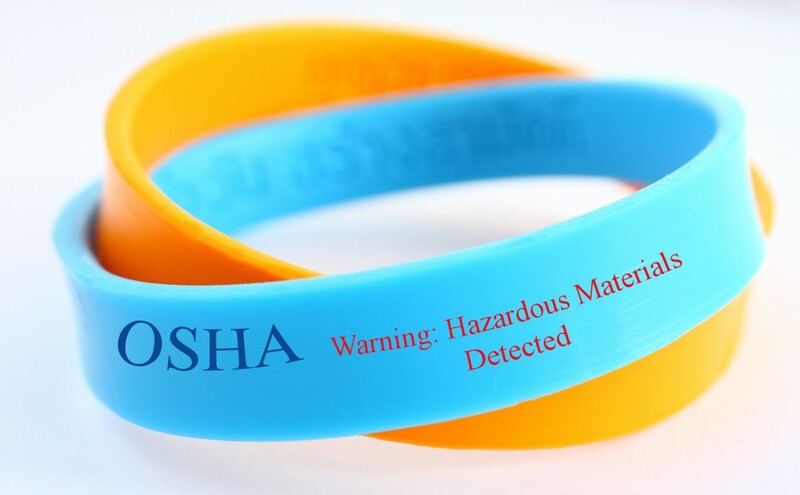 According to Kim Anderson, head researcher on the project “we can screen for over 1,000 chemicals that may accumulate in the wristbands, currently, PAHs, pesticides, flame retardants, PCBs, industrial chemicals and consumer products have been quantified on the wristbands.” The initial results, in fact, showed 49 chemicals absorbed by the silicone over the course of the experiment, including some which have been linked to cancer. The practical applications for surveying work sights and judging exposure levels for workers are quite clear. OSHA requires training regarding hazardous materials, chemicals, and carcinogens in the workplace. OSHA-Pros offers a GHS and OSHA Hazard Communication Course [link to course goes here], covering the use of Material Safety Data Sheets, HazCom (Hazardous Communication) Standards and the new GHS (Globally Harmonized System) to avoid risk of exposure to environmental hazards in the workplace. By complying with these regulations, you can ensure safety for yourself and your employees; and in the near future inspections may be performed with a silicone wristband rather than expensive lab equipment.